My first Joe Abercrombie book. Being a fan of Grimdark fantasy, I feel like I should be shunned, or maybe stabbed, for stating that. Honestly, and no offense to Joe, but I hadn’t heard of him until last year and my TBR was to a point of no return to the Grimdark origins. Not until I began following Mark Lawrence’s works and joined a few FB groups did I see his name mentioned, and boy was it mentioned A TON. Whelp, I am here to say that I thoroughly enjoyed Half a King and I am displeased with myself that I waited as long as I did. Yarvi is not the prince they wanted. Born with half a hand, he is seen as weak by the world surrounding him and is therefore cast out by his family on the day he is meant to be named king. The Shattered Sea is cruel mistress, but Yarvi somehow survives its icy depths and is sold into slavery. With a vow to reclaim the Black throne, and avenge the deaths of his father and brother, Yarvi breaks his chains and, along with a band of outcasts, travels back to regain what was lost. But what lies ahead may be more than he can handle. If there are any books I can compare Half a King to, it would be Lawrence’s ‘Prince of Thorns’. Though it is a coming of age story, it is more than that. It is about a young man who is thrown away and, somehow, manages to pick himself up and fight back. It isn’t all about fight scenes, although there are some to enjoy, but about how cunning is used to overcome your adversaries. Joe’s writing is immaculate and detailed, especially for what I felt was a short book (even at 336 pages). I was drawn into John Keating’s narration and the time just seemed to fly by. The worldbuilding is what you come to expect nowadays from fantastic writers and the tone is perfectly grim. 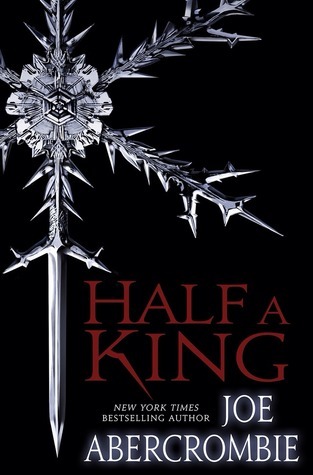 Half a King is on perma-sale (at least is seems that way) on Amazon for $2.99, so I highly suggest picking it up if you have not done so. I would also recommend the audio as Keating did a phenomenal job (also narrated Malice by John Gwynne if you have a spare credit). I am very much looking forward to Half the World (Book 2) and beyond. Joe rightfully earned a place toward the top of my list of authors with this one.